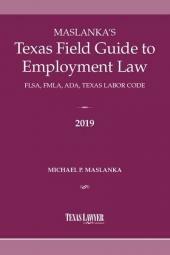 In this fully revised edition, author James A. Matthews, III, has provided a thorough and focused examination of the federal, state and local equal opportunity and employment laws governing Pennsylvania employers and employees. 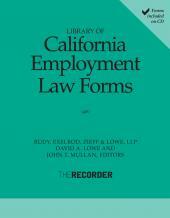 In addition, substantial appendices of statutes, regulations, forms and other materials have been included in this new edition. The recently published Pennsylvania Labor & Employment: Employment Discrimination text is summarized in Chapter 3 of this edition of Pennsylvania Labor & Employment Law. Chapter 5: Non-Statutory Limitations on Employment-at-Will: "Public Policy"
This area of law has evolved and become increasingly complex. Treating all of the relevant topics in a single volume became impractical. In order to provide a thorough treatment of the issues, the area of employment discrimination deserved a book of its own. 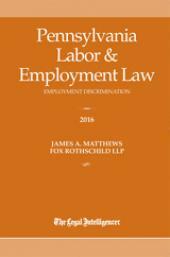 Accordingly, Chapter 3 of Pennsylvania Labor & Employment Law in the first edition is now a separate title: Pennsylvania Labor & Employment Law: Employment Discrimination, published in December 2015.